Manolo and Clint schooling on a 12 meter circle to the left looking for even, fluid bend. A core principle of Training for Wellness™ is to develop straightness which can be defined as good spinal alignment, musculoskeletal symmetry and ambidexterity without creating mental or physical stress, pain, tension, discouragement or sadness in the horse. One way crookedness damages the relationship between horse and rider besides making the horse painful and eventually lame is that it can make riders unfair with and angry at their horse, and act harshly. Riders do not always recognize that the horse is not “hanging on the outside rein'” or being “lazy”, obstinate” or “resistant”when it does not travel equally well to both reins. 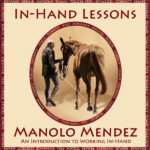 What the uneducated rider experiences as the horse “holding or hanging onto the bit” and refusing to relinquish it and bend to the inside has nothing to do with the bit or the horse being willful and resistant. The horse has no choice in the matter – it is held prisoner by a muscular straight jacket that is man-made or exacerbated by riding. How come? Because too often, horses are started without the right amount of consideration to building their fitness, suppleness, straightness and balance from day one, in-hand and later under saddle, to minimize and make manageable their slight in-born crookednesses which riding magnifies and turns into a health hazard by the time they are in regular work. When the horses’ body is crooked, it is contracted on one side and hypo-tense on the other. When the contracted side is on the outside of bended lines or circles it has great difficulties stretching and cannot straighten and change bend. 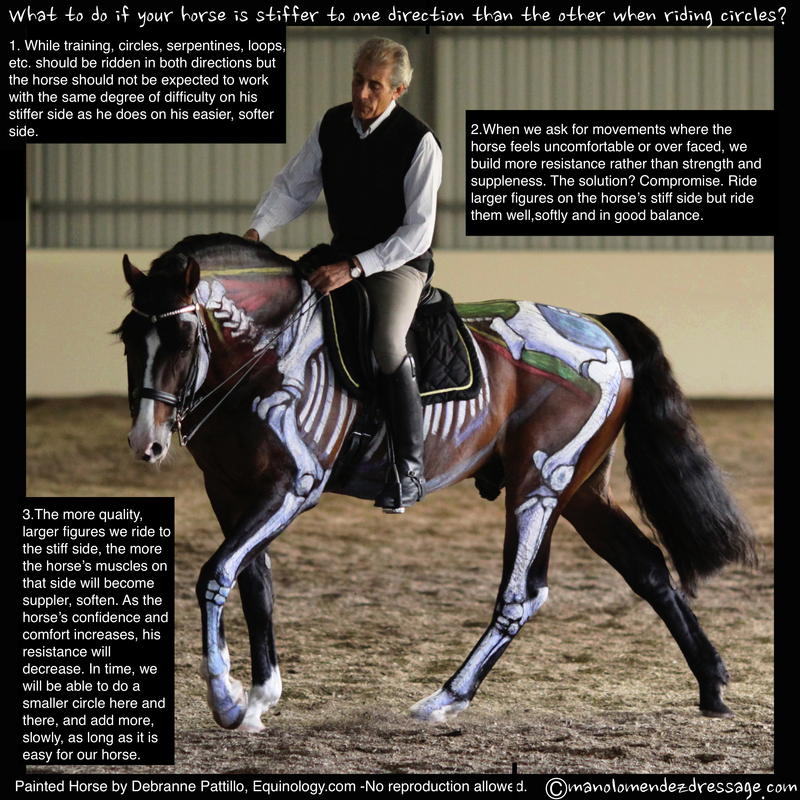 When traveling with the contracted side to the inside of the bend, the uneducated rider experiences the movement as more fluid, easier to achieve thus better or more correct which is a misleading impression as a crooked horse is a crooked horse to both hands. Our friend Dr. Dr Kerry Ridgway, Equine Therapeutic Options explains this beautifully and in great depth. To help the horse travel soundly and protect it from the effects of crookedness we have to recondition his body and help remodel his muscles, tendons and ligaments so they are equally developed on both sides of his body and he can carry us with ease and without developing unhealthy compensation patterns. We have to train slowly and progressively so the horse can come to use his entire body equally well left and right and help it regain his balance and ability to load all its joins equally. As we do this, always in a good posture, with particular attention to the horse’s rhythm–we neither rush him of his feet nor denature his gaits by asking him to shuffle — we are also training the horse’s central nervous system and making it possible for signals to travel easily and fast throughout its body which is what creates an exquisitely responsive horse, we are also training his heart rate and breathing so that he can stay comfortable and clear headed as the training becomes increasingly demanding on its body. With every single ride, we are also training him to trust us and have confidence that we see, respect and love him as the individual he or she is and we recognize that his body is standing in the way of his desire to work with us. By not punishing the horse for what he cannot do, by teaching him how to move in a manner that makes it more and more pleasant and pain free for him to carry and move with us, we teach the horse that we are fair and a good companion. Stewarding a good equilibrium between all these mental, emotional, neurological and musculoskeletal conditions is what leads to balance in movement and a sounder, more contended horse. It is what leads to the kind of partnership in the saddle every rider dreamed off when they began to ride. When we do not yank the bit brutally on one rein, when we do not spur or kick his side hard to get him to fold himself around our leg, when we do not tie him up in all kinds of contractions to make him give as though he is willful or lazy, stupid or obstinate we teach the horse about what kind of person we are. When we act as a bully, wether we understand that we do or not, horses may carry us passively, stoically through some of these unfair actions but they retreat far from us and learn to protect themselves from us by connecting only on the very surface of their beings. We miss out on the very thing that drew us to them in the first place. The dream of connecting to a creature that is as noble and gentle as it is beautiful. Training horses is never about training just their physical bodies nor is it ever only about “just”the horse. How we work towards straightness and balance is a litmus test of our willingness to listen to our horse and get the education we need to help him prosper in our care. Training ultimately is always about the person doing the training.